When we were in Salzburg, Austria, in 2008 on our big travel adventure, we were walking to church one Sunday morning. (I kept a blog documenting our adventure and talked about our Sunday in Salzburg here.) It appeared to me that Sundays in Austria were lovely days of family, worship, and food. As we walked to church – the very church in which Mozart was baptized and played the organ – I noticed people eating their breakfasts outdoors in the morning sunshine. I saw sweet rolls, and crusty hard rolls and cups of coffee. At one point, I noticed a woman eating a plate featuring a soft boiled egg sitting in a white egg cup. I can only imagine the deer-in-the-headlights look a server at Village Inn would get if I answered the question how would you like your eggs cooked? by saying soft boiled. I, of course, am very familiar with soft-boiled eggs because that was the only way my Swiss grandmother ever prepared eggs for me. Being a child, I didn’t watch how she prepared them. I only know they showed up on my plate almost too hot to touch. I learned at a very young age how to use the knife to cut off the tip of the egg so that I could reach the gooey yoke inside. I would cut my buttery toast into strips and begin dipping them into the yolks. To this day, I love soft boiled eggs. It’s beyond Bill’s comprehension. He prefers his eggs scrambled. When I fry eggs for the two of us, he requests that his yolks be broken so they don’t run. He’s simply not a fan of runny yolk. I, on the other hand, love them. When we used to be worried that we were going to die from eating undercooked eggs, I dutifully ordered my eggs over medium. Now that we seemed to have calmed down and don’t worry about that quite as much, I prefer them poached or sunny side up. I love to have my yolk run into my potatoes. Especially when eating Huevos Rancheros. Yum. I don’t soft-boil eggs very often, and I’m not sure why that is true. They are very easy to do, and I prefer them to scrambled eggs. But since eggs are low in fiber and high in protein, they are a great meal for me. 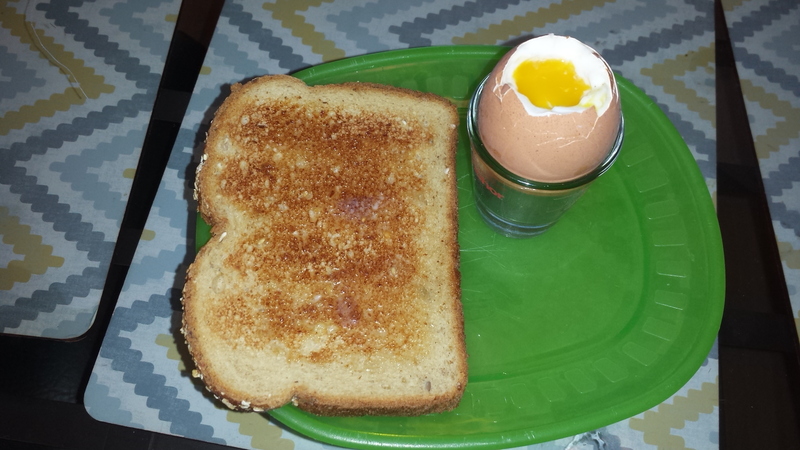 I have to admit that an egg with a piece of white toast spread with real butter makes me feel less deprived. Here’s how to make a perfect soft-boiled egg…. Bring a saucepan of water to a boil, and then lower the heat so that the water is just simmering. It should look sort of like club soda. Once the water is simmering, carefully drop one or two eggs into the water. Set the timer for 5 minutes. (Add a minute if you are cooking more than two eggs.) Don’t set the timer until you have put the eggs in the simmering water. When the timer goes off, remove the eggs and drop them into a cold water bath (a bowl of cold water with ice). Let them sit for a few minutes. That will make them easier to handle and make it easier to open the egg. My grandmother had egg cups. I have them in Denver, but haven’t bought them yet here in Arizona. So I improvised using a shot glass. I also saw a photo of someone setting a soft boiled egg in a cup with uncooked rice to keep it upright. Take a sharp knife (I use a steak knife) and carefully cut off the tip of the egg. Watch for egg shells. Dip pieces of buttered toast into your egg, or use a small spoon to eat the egg. You can buy fancy spoons, but quite frankly, I use the baby spoons that my grandkids used when they were small.